Facet joint syndrome (a.k.a. 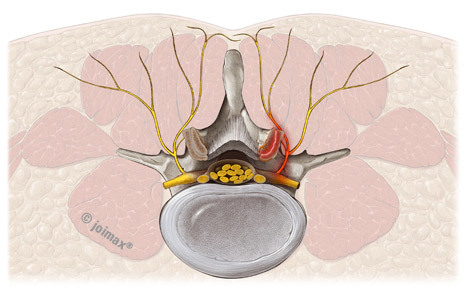 osteoarthritis) is a pain at the joint between two vertebrae in the spine. When cartilage is present in these joints, they can move smoothly against each other without grinding. Each joint is also lubricated with synovial fluid for additional protection from wear and tear. Without these joints, our backs would lack flexibility and be unable to bend and twist. A swollen or inflamed facet joint causes pain, numbness, and muscle weakness which will affect different parts of the body depending on which nerves are affected. If the nerves affected are in your cervical spine, you may have symptoms in your neck, shoulders, arms, and hands. If the nerves are in your lumbar spine you may have symptoms in your buttocks, legs, and feet. Once facet joint syndrome is confirmed, your doctor will likely recommend conservative treatment options. Physical therapy sessions can alleviate inflammation and reduce pain, which leads to greater mobility and strength. These sessions may include the use of ice to decrease blood flow and reduce swelling. Massage, muscle stretching, and exercise will also help regain mobility and flexibility. Spinal Injections using cortisone will also calm pain and inflammation. This method is temporary and provides relief for several weeks or months. If conservative treatment does not reduce pain, endoscopic blocking of the nerves can be an effective method. This treatment involves severing the pain-transmitting nerves so that pain signals cannot be sent to the brain. By using a miniature camera on an endoscope, a radiofrequency probe is inserted through a small incision to block the nerve fibers that are transmitting the pain signals. When the procedure is complete, the small incision is closed and the patient is able to return home later that day. When not addressed through conservative options or surgery, facet joint arthritis will leave bone rubbing on bone. This will lead to bone spurs pressing into the nerve roots and causing spinal stenosis. If you have tried conservative treatments that have not provided relief, contact Minnesota Spine Institute today for a free consultation and MRI review. Their caring staff has helped thousands of patients regain their mobility using advanced pain management solutions.